I am always trying to brainstorm ways to make my job as a mom and the puppet master of our home easier. That being said, one of the ways I keep everything organized is sticking to my house duties routine and learning effective ways to do even simple tasks. today i’m going to show you how to load a dishwasher so that everything fits and gets clean! 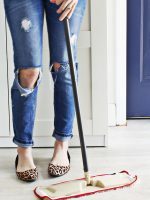 I usually keep the house picked up and do the dishes and my husband helps with the emptying the garbage cans, laundry and he helps me “deep clean” on Saturday mornings Today, I’m going to share my tips, tricks and routine to keeping your dishes (and your kitchen!) sparking clean. I feel about 100x more productive when my kitchen is clean. I do my dishes at the same time every day. Well, twice a day. Every day, I unload the dishwasher while my kids eat breakfast and get ready for school. That leaves me with a place to put all dirty dishes throughout the day. My kids finish breakfast and place their dirty dishes in the dishwasher. I use this time to tidy the kitchen quickly and wipe off the countertops and appliances quickly. Nothing major, nothing stressful. Just a quick clean up. 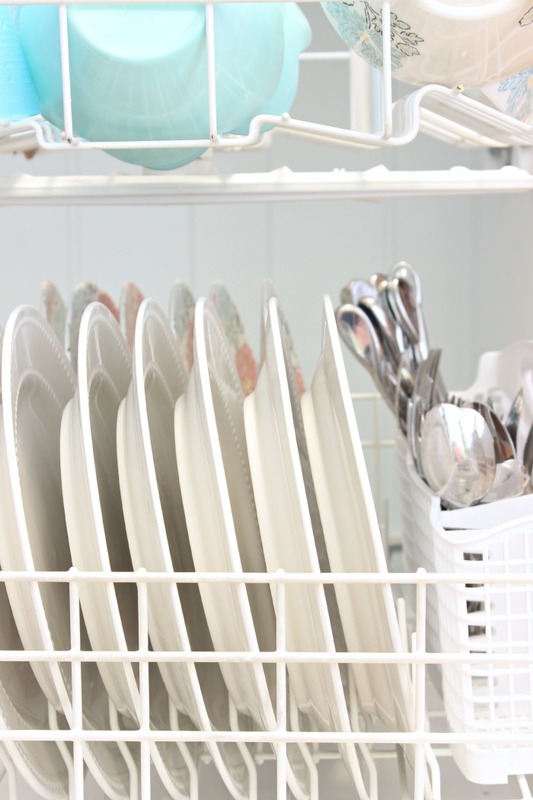 Loading the dishwasher is easy if you do it right. This is key to clean dishes! 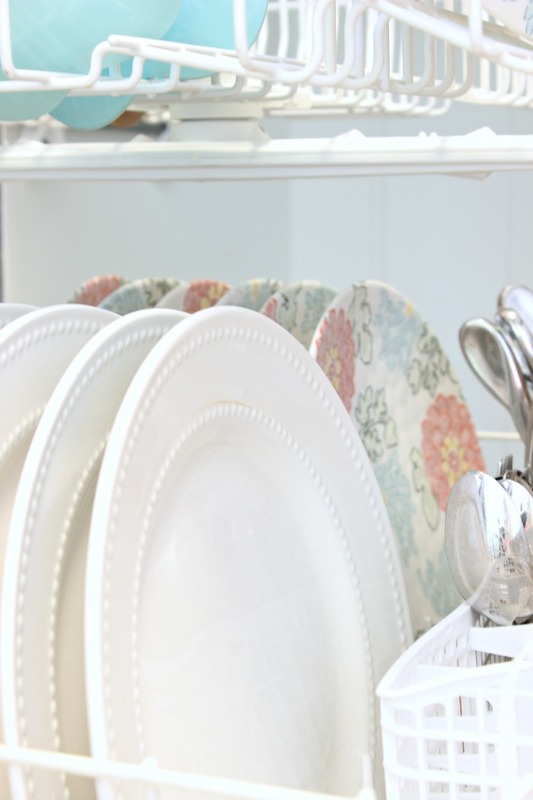 There is an easy method to getting your dishes completely clean. First, place like items with like items. 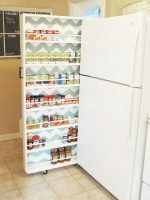 This frees up space and allows you to really fill your dishwasher to it’s proper capacity. Load large and tall dishes on the bottom rack face down so the sprayer can spray them thoroughly to clean them. Put glasses and fragile items on the top rack. Load all glasses and cups (and baby bottles if you’re like me and have a little one at home!) Put glasses in between the tines, not on top as it can leave a water spot. Place silverware and flatware in the basket provided but do not spoon the spoons. haha! Make sure they’re all alternating directions as to not stack on one another; this can prevent proper cleaning. Make sure nothing is blocking the powerful sprayer at the bottom and make sure nothing is blocking the little detergent door. Every dishwasher manufacture has their own suggested way of how to load a dishwasher so make sure you look up your brand’s make/model so that you’re aware of anything you need to do for your specific model. This topic I’m pretty serious about you guys. We moved int a home where we have hard water and no matter how much I pre-washed, our dishes came out gross looking! I ended up pre-washing so that the dishwasher step was almost unnecessary except that I feel like the detergent and high heat of the water and dryer helped to sanitize the dishes a bit more than hand washing alone. I exclusively use OxiClean Concentrated Crystals. 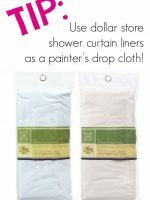 A few months ago, I was tidying up and casually read the package that these paks come in and it claims “Eliminates Scrubbing, Stuck-on Food and Film & Spots” WHAT!? I literally read that and said “What! ?” out loud to my friend who was visiting. I looked at her and asked, “do you think this is true?” She and I agreed to try it out and see! It was kind of fun having a friend over to do this little experiment with my dishes. I decided not to scrub or pre-wash any of my dishes other than scraping food into the garbage disposal. I even chose not to scrub the pot of macaroni and cheese that was left out from dinner the night before. I scraped everything into the garbage disposal and loaded it in the dishwasher. 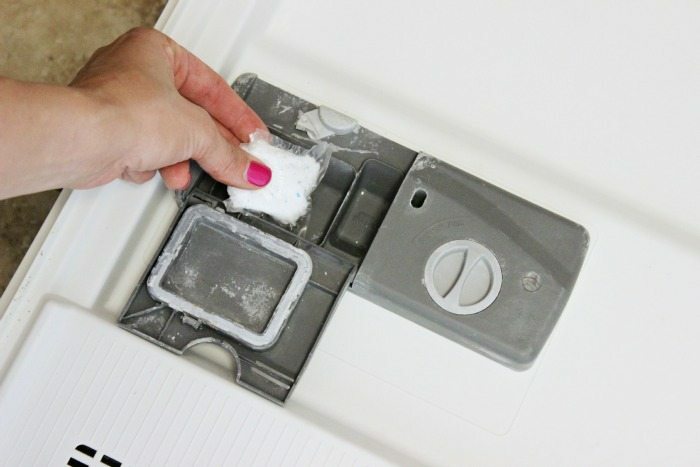 I just place the tabs (that come pre-measured in a little clear package) in the detergent door and snap it closed. My friend and I finished up our craft day when I noticed the dishwashing cycle was complete and I excitedly ran over to check the results. Again, I looked at her and said “What!??! It seriously worked!”. We were both shocked and excited. I have since used this detergent over and over and can’t believe the amount of time I have saved by NOT pre-washing dishes! 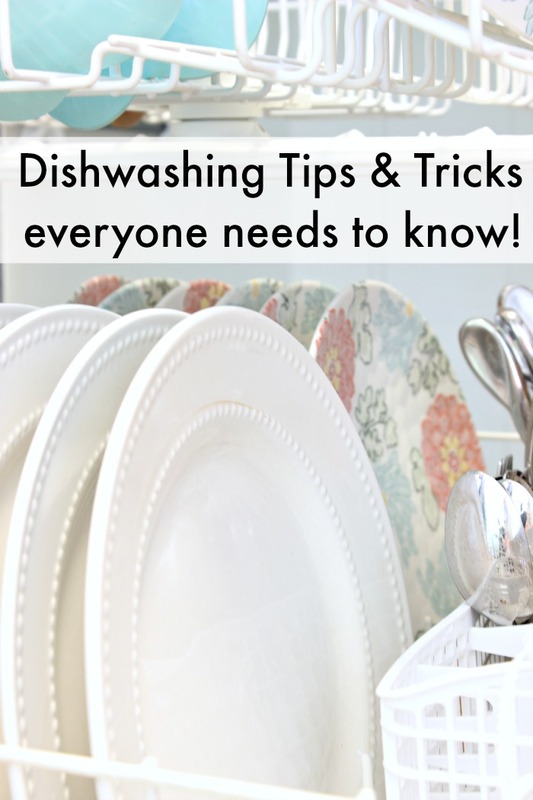 If you don’t know how to load a dishwasher, it doesn’t matter how great your detergent is, the water and detergent won’t reach those areas and your dishes will likely not be clean. I love your tips! I am very bad in keeping my home cleaned and organized and the fact that I have a dishwasher made it much better already! One of my resolutions for 2016 is to become more organized and I want to start with regularly loading the dishwasher and doing the dishes. Thank you for the tips! They are really useful for me! I am dying to know where the white dot dishes are from! They are from the dollar store years ago! Can you believe it? So true about not spooning the spoons. It really makes a huge difference when you load them properly ! Where do you purchase your oxiclean dishwasher cleaner? I’ve looked online and can’t find it? Thank you! I have links on the post! It’s amazing!